Well, it's time for another fun Make it Great Monday linky party...unfortunately (for me) I've decided that this will be the last one for awhile. I can't tell you how much I enjoy having you all come here to share your creative ideas but I'm finding that I just don't have the time to devote to it that I'd like to. With Christmas coming up I've got a list of presents to make that I haven't even started, I'm trying to get back to house reno's, and I've started a new job. When I do something I like to do it right and it bothers me that I can't get to each and every one of your projects to leave a meaningful comment but, I simply can't find the time lately. 1. Kathy from Life on Lakeshore Drive has a neat way of making pinecone trees. Visit her blog to learn how. 2. Fonda from Southern Scraps made a great Anthropologie knockoff necklace. I love how she used that one red bead. 3. Christine from The DIY Dreamer made the happiest coasters I've seen in awhile. Check out her great step by step tutorial. 4. Fancy That Notion is getting ready for an avalanche of paint chips and made some pretty bookmarks. Go find out how came to inherit so many. 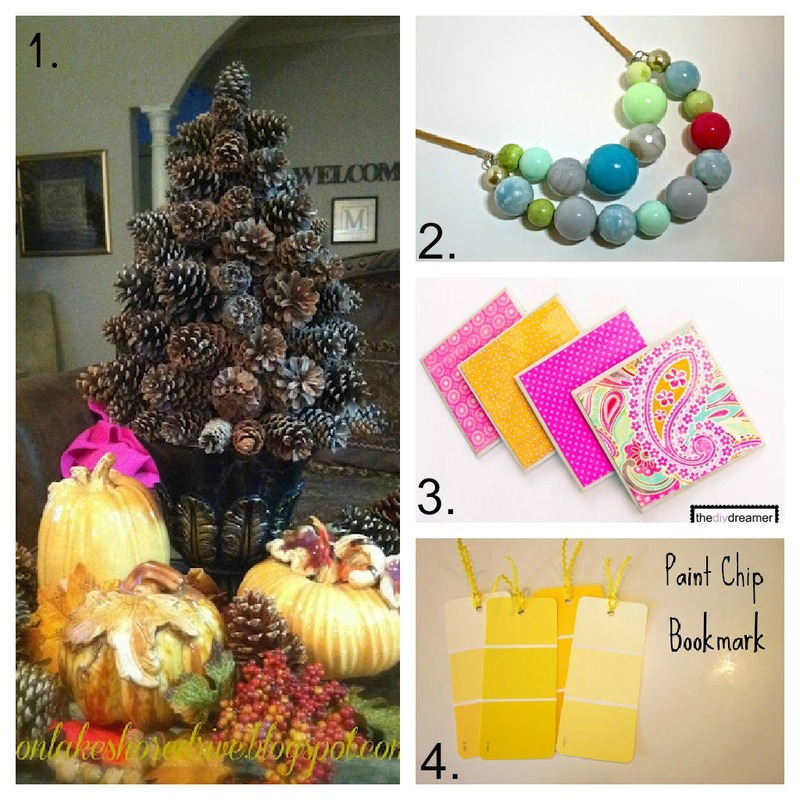 Thank you so much for featuring my Pine Cone Tree!! I am so honored and thrilled to be chosen among all the wonderful projects. I am proudly displaying my button! Thank you for hosting another awesome party. Have a wonderful week. Great features Tamara! Thanks for hosting again such fun party. Good morning!! I've linked up my Tasty, Homemade Toothpaste (#49 ). It's non-toxic, cheap to make and true to its name-tasty. The toothpaste isn't chalky and leaves your mouth feeling refreshed and super clean. I hope you enjoy and thanks for the link party! I'm sorry to see your link party put on hold for a while, but we all know how busy life gets as well - it creeps up on you sometimes. Good luck with everything and looking forward to your Christmas posts. So glad I discovered your party! Thanks for hosting! Hope you are doing well!